So Viacom have finally had the decency to allow Channel 5 to air some series 19 episodes! Yep, they're celebrating Christmas with Thomas... one month late (they did air series 13-18 festive episodes during the period, but don't you think new episodes would, or should, take priority?). 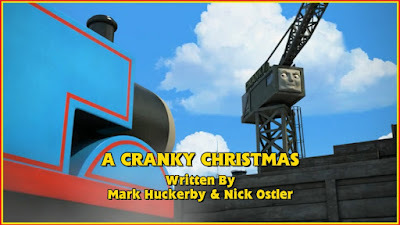 So here's my review (finally) of A Cranky Christmas! So, this episode is... rather dull in all honesty. It feels as though it was elongated solely to fit the allotted time. The plot itself seems to feel similar to Who's Geoffrey? as well. In that episode, Thomas causes an accident and tries to cover his tracks, and Cranky does the exact same here, only he doesn't make up a different crane causing the problem, solely saying "it wasn't delivered", so at least Cranky can say he can create the better excuses, although he'd have to work on his poker face. As for the crate itself, how did it survive? With the height it fell from, wouldn't it have shown some sign of damage? If not the crate, the wooden pellet it was on! Also, how was Cranky scared of a ship's horn going off? He's been there for years; you'd think he'd be used to those sounds by now! Also, the job was kept intentionally vague just so they could have the big reveal at the end. even though it felt like it was being foreshadowed that ice would be involved with all the slipping (whether it was intentional or not I don't know, but that's the feeling I got after seeing this a couple of times for the review). But those are the really memorable moments. Well, except for a couple more things, both of which are positive. First, Thomas and Edward's friendship is still wonderfully genuine and heart-warming. Even if they don't have Edward as the star that much in the future, continually having him on screen with Thomas will always be gold. Also, even though the episode was rather dull and mundane for the most part, there were a few scenes that were pretty funny. Cranky's reactions were pretty entertaining, as were the Fat Controller's shenanigans. There was also a slow motion "No!" similar to the one from Sodor's Legend of the Lost Treasure, which was great. #S19XmasCranky A mixed bag. Decent cast, music, and humour, but Thomas has too much screen time, Cranky too little, and it feels unfocused. #S19XmasCranky That "DUN" moment when Thomas describes the box Cranky just "broke;" it's like they were intentionally imitating season 1! #S19CrankyXmas This episode wasn't all the best but I did like the moral it taught , the humor and the little bits about sandboxes. I suppose I best watch today's episode. I am warning you though, if any clips from today's episode end up on You've Been Framed, I'll sue. Thomas is delivering salt. Must be for Archie's Fish Shop. Promised I'd promote him on here in exchange for a free can of Sprite. Didn't even know engines had sandboxes. I wonder if there's room to build a sandcastle in there? A question that needs answering ASAP. For those who are interested, the extra cargo Cranky talks about is my jaffa cakes. Always stock up over winter. Squirrels taught me that. I strongly suspect the Mayor is actually Patrick Trueman from EastEnders, but I don't like to ask. That was a lot of drama for nothing. I thought the crate was going to land on someone the way they built that up. Disappointed. The Mayor and I are actually in talks to become a new Torvill and Dean tribute act. Watch this space. A sing-song? How delightful! I'm gonna be your sledgehammer! Oh, hang on. It's that crappy Christmas song. It's not even Christmas anymore. A load of crap. They cut out the best bits. I threw an ice-skate at Edward, you know. Comedy gold. Not happy. Crap episode. Goodbye. So... yeah, I'm not much for this one. It's not a particularly bad plot, but it does still feel similar to Who's Geoffrey? making it pretty forgettable. That said, it does have its moments if you do see it. Also, the voice acting was great, especially John Hasler as Thomas and David Bedella who (hopefully) has taken over as the mayor in the UK permanently. He's a great actor who's brilliant as Victor (and should've voiced him in the UK and US from the get go) and he's really good as the mayor as well. To be honest I agree with pretty much everything said here, even if I'm probably a tad more lenient on it. The story's kind of a rehash and it's not that interesting. Edward's great but... not much else to say. 4/10. Hmm...pretty reasonable. The episode does indeed share similarities with a Who's Geoffrey? yet Cranky's errors aren't as focused. Yet I still like it, hence the consistency in the show's humor like you mentioned. I also think that Arc and Hartshorne are improving by this point because they've done wonders with this episode. I think Edward and TFC were the highlights in the episode's characterization and the consistent use of sandboxes in the show is great. While I agree that these things are to be commended, there needs to be more done to ensure the base story is entertaining enough on its own merits.